Who Helps You Take a Leap of Faith? Working in an alternative workstyle, it is often hard to separate work from one’s personal life, but I find these spurts of total disconnect to be some of the most inspiring and worthwhile trips to help me refocus and see the big picture. 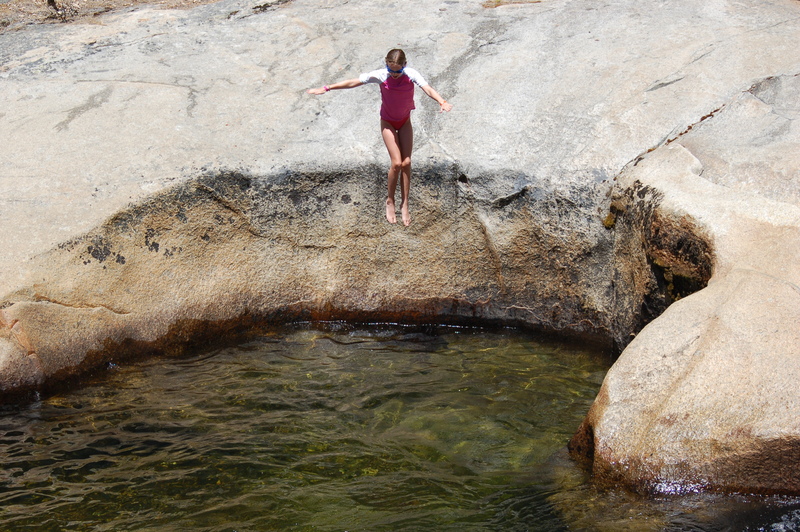 Recently, while “off the grid” and exploring remote parts of the Stanislaus National Forest with my family and friends, we had the great fortune of coming across some gorgeous granite pools, complements of the Tuolumne River in California. These pools are made from snow run-off and they are “take-your-breath-away” cold. They are not the kind of pools you can gently wade into, allowing oneself to gradually get accustomed to the shocking temperature. These are the kind of pools one must brazenly jump into. My youngest daughter loves these pools. She goes right up to the edge and shows no fear – no hesitation before jumping in, beaming her huge smile the entire time. It’s amazing to see her courage and confidence in her decision to leap forward. I always describe her as my “leap before looking” child. Her older sister is the “look before leaping” kind. She walks to the edge, looks over, looks back, smiles nervously, and then gathers the courage to jump. She jumps in, though takes a little more time to execute. I overheard my younger girl talking to her older sister about how she can muster the courage to just jump right in. Her answer was simple. “I just think, what would daddy do? And I know he’d jump in, so I just do it”. What enables her to take such risks, is the faith she has in her mentor (daddy), that the “looking” has already been done. She doesn’t feel the need to re-evaluate the decisions that have already been made by someone she trusts. She can just leap because her mentor has looked. What a powerful motivator the right mentor can be. It’s easy to spend too much time taking small steps while calculating the risks of moving forward. Small steps become comfortable and allow us to acclimate to change. They are safe. But too many small steps gives us time to hesitate, turn back, miss the opportunity that is right in front of us. We also need to take those big leaps of faith, those risks that push us forward quickly, boldly, without the opportunity to turn back. Having faith in a mentor who already knows and accepts the risks ahead of you can be a powerful force in executing those leaps with courage and confidence. Do you have a mentor that is powerful enough to help you take those leaps of faith, that can help you take those risks that can lead to great things? 5 Responses to Who Helps You Take a Leap of Faith? Great post. Made me realize how easy it is to just work hard, rather than work strategically. Time to blaze that trail. Thanks for the gentle reminder! Having just returned from another inspiring week “off the grid”, I wanted to re-post this as a thank you to the many who have mentored and helped me in this alternative journey. Your support, inspiration, guidance and wisdom is much appreciated. It’s always exciting to read through content from other writers and use something from their sites. I’m glad you found this, and appreciate your comment. Thank you!